I recently received a scrapbook kit compliments of the Scrapbooking Store and decided it would be fun to create some quick and easy note cards with the papers, stickers and gold Thickers letters in this kit. The papers are from Echo Park and all were double sided patterns in coordinating colors. If you like what you see I even have a coupon code for you to get 10% off a purchase at the store (see towards end of the post). Everything shown here is from the September 2018 kit. Here are a few more details on how I combined some of the elements in the kit. On this card (below) I cut the strips of tickets on one of the 12 X 12 papers and arranged in a V shaped formation on top of two patterned paper layers. 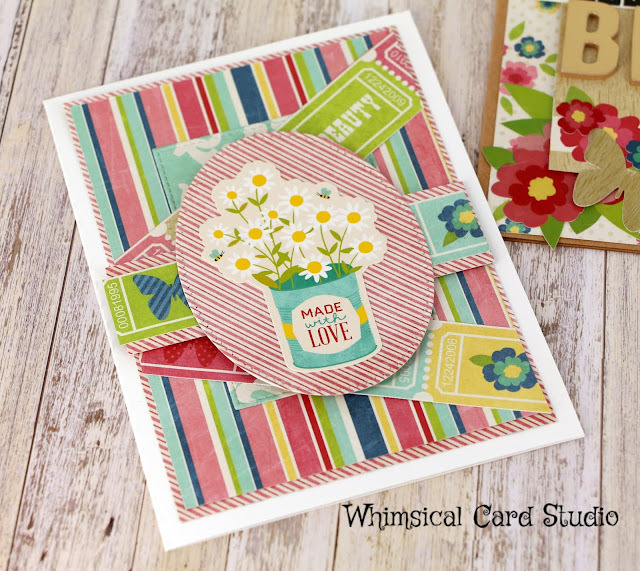 I die cut the striped pattern paper and added the floral sticker as the focal point. I used a combination of letter stickers (black & gold small) plus the gold metallic Thickers stickers to create the Happy B-Day sentiment below onto layers of patterned paper. I used floral and butterfly stickers from the kit to embellish the card. 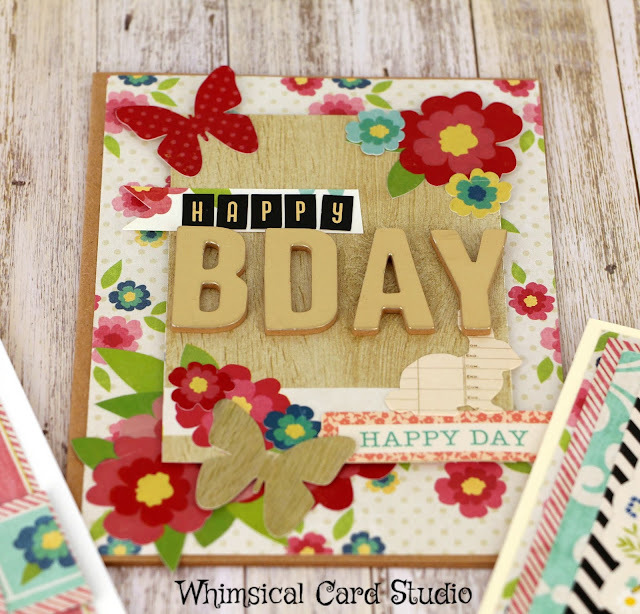 For the third card I combined layers of patterned paper first. I used a black & white accent sticker to create a contrasting embellishment in an "L" shape, then added the focal point - a sticker of a floral arrangement in a mason jar. I added some of the bees stickers as accents. For an extra special touch I threaded one of the button stickers with twine before adhering to the card. The twine is the only thing I used (other than my cardstock bases) that isn't part of the kit. 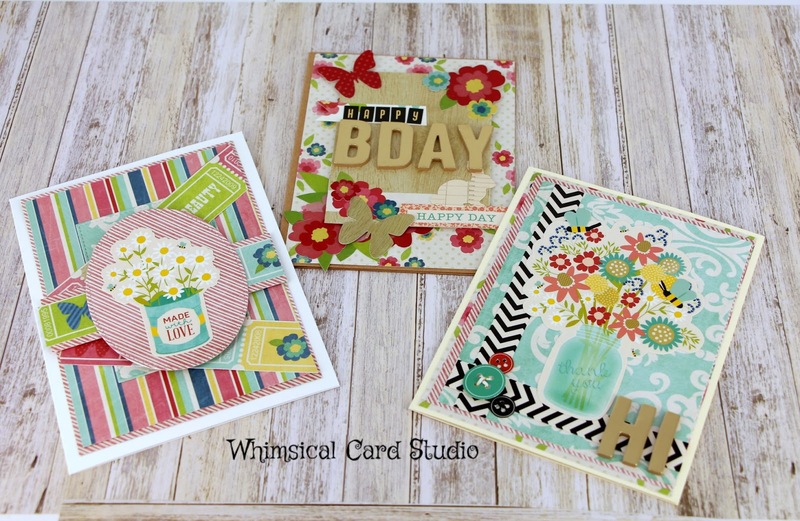 Of course this kit will make some very lovely scrapbooking layouts, but cardmaking is my jam! Without further ado here's the coupon code.